October 14, 2017 was a symbolic day for Tamil Nadu, and in some ways, for the entire country. That day Anna Dorothea arrived at Port V O Chidambaranar, formerly known as Tuticorin port, and brought the country’s first consignment of imported river sand. It was loaded with more than 55,000 tonnes or 1,850 truck-loads of sand from Malaysia’s Sungai Pahang riverbed. “We were flooded with orders within hours of unloading the shipment,” says a jubilant Vijayaraj of MRM Ramaiya Enterprises, the sand importer. All the orders were from construction companies from the state as well as from neighbouring states where businesses had taken a hit due to shortage of the seemingly abundant natural resource. Sand is crucial in the production of cement as well as for making concrete. But not all kinds of sands are suitable for construction. In deserts, where wind has a free play, sand grains are too round to stick together. Sea sand is better, but its salt content does not work well with steel in reinforced concrete. This makes river sand a prized as well as endangered mineral (more on this later). Vijayraj says within days of Anna Dorothea’s arrival, his company bagged orders for another 700,000 tonnes of imported river sand. But his euphoria did not last long. On October 25, as MRM Ramaiya was transporting sand to its buyers, six of its trucks were detained in Kanyakumari by the state police. A case was registered against the drivers for transporting the mineral without mining operation licence as mandated under the Tamil Nadu Minor Mineral Concessions Rules, 1959 (TNMMCR). MRM Ramaiya also received a letter from the port chairperson saying that the company cannot transport sand until it obtains all the required permissions. On November 1, MRM Ramaiya moved the Madras High Court, which ruled in its favour. The court’s 50-page judgement acknowledges the high demand and an equally high shortage in the minor mineral’s supply. But what won MRM Ramaiya the judiciary’s favour was a legal loophole in TNMMCR. Tamil Nadu had framed the rules under a Central legislation, the Mines and Minerals (Development and Regulation) Act, 1957 (MMDR), which allows states to make rules related to minor minerals, such as building stones, gravel, ordinary clay, ordinary sand and construction sand. However, TNMMCR deals only with minor minerals quarried within the country and not the imported stock. Besides, in 2014, the Union Ministry of Commerce and Industry allowed imports of sand to increase its availability. Under its notification, a company had to just get itself registered as an importer and procure a certificate under Plant Quarantine (Regulation of Import into India) Order, 2003. MRM Ramaiya complied with both the criteria, the court said. As Ramiya resumed business, Tamil Nadu, in a desperate attempt to keep the mineral under its control, issued a Government Order on December 8 that says sand imported for construction purposes can be sold only to the Public Works Department (PWD), which is in charge of sand quarrying and trade in the state. The sand will have to be sold at the government rate and can be transported to PWD depots only after obtaining a valid permit. Wielding the Government Order, the district administration of Tuticorin, on January 25, issued a notice to MRM Ramiya that said the company has flouted the state laws. Later that month, the state government moved the Supreme Court against the Madras High Court’s ruling favouring MRM Ramaiya. The apex court in its interim order on May 16 said that a Government Order cannot be implemented retrospectively. However, it asked PWD to conduct a chemical analysis of the imported sand to ensure its quality. PWD will have to buy the entire stock of MRM Ramiya lying at the port if it found it was fit for construction. The next hearing is on July 9. When Down To Earth asked the Tamil Nadu PWD why it has been challenging the import of sand by MRM Ramaiya, a highly placed official, requesting anonymity, said one cannot simply import and start selling sand. “What if the imported sand is not of good quality? The government will have to answer in case an infrastructure collapses!” PWD’s concerns have merit. Poor quality sand affects the quality of concrete and thereby the durability and load-carrying capacity of infrastructure. But those associated with the construction sector doubt the government’s intentions. In 2003, when PWD was made incharge of sand quarrying and trade under TNMMCR, the aim was to curb illegal mining and check inflation of sand price. But the department has miserably failed in these objectives. “The government has fixed the sand price at Rs 1,050 per tonne. But while procuring one has to shell out anything upwards of Rs 4,000 a tonne,” says L Venkatesan, a Chennai-based developer who is a member of the Builders Association of India. Ashok Kumar, MRM Ramiya’s counsel in the Madras High Court, explains: “On paper, PWD conducts sand mining auctions once every one-three years and awards mining rights to those who win the bid. But in reality, only a handful of regulars win the contracts every time, be it under the government of All India Anna Dravida Munnetra Kazhagam party or Dravida Munnetra Kazhagam.” And they are the ones who call the shots. “PWD sees us as competition to these players and is thus trying to snuff us out,” Vijayraj alleges. The state also has a provision of buying sand online. “If you use the online system then there is a long wait from when you place the order to when you actually get the material. Waiting increases the cost of construction for me, and it’s a loss,” says Sridhar, a builder based in Chennai. The influence of the sand mafia in the state can be gauged from the fact that in early May a special branch constable, Jagadish Durai, was murdered by the sand mafia near Nanguneri in Tirunelveli district after he tried to arrest them when they were illegally lifting sand from the Nambiyar riverbed. 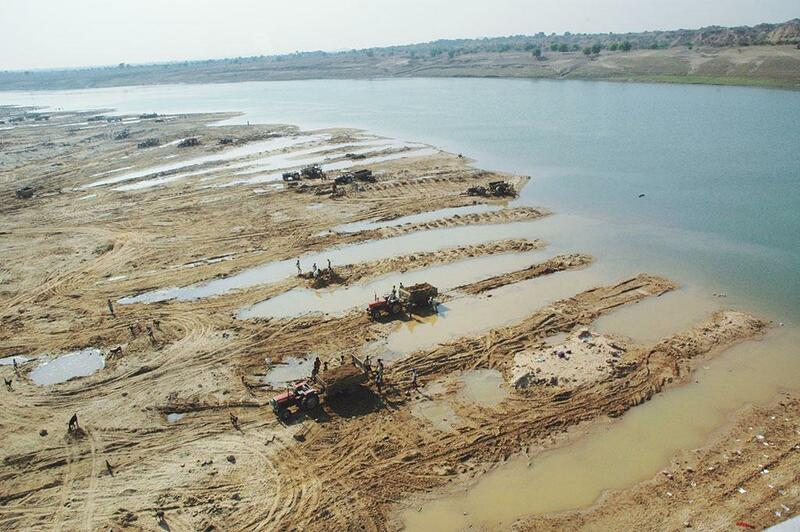 A report on illegal sand mining in the Cauvery and Coleroon rivers in Tamil Nadu by a committee appointed by the Madras High Court in an illegal sand mining public interest litigation, found rampant illegal mining in all the 24 allotted sand quarries along the rivers. “The report found that in legally allocated mines, lease holders had extracted more sand than the permissible limit. In many areas, mining was being done without any permission,” says Teumalai Raja, counsel for the petitioner in the case. Whether under mafia pressure or to assert its monopoly, Tamil Nadu is reluctant to loosen its grip over the golden granules. But it has realised the potential of imported sand to fight the dual menace of sand shortage and illegal quarrying. In March, the state’s PWD issued a tender notice to import 3 million tonnes of river sand from various countries at a whopping Rs 548.73 crore over the next two years (see Flouted with impunity, September 16-30, 2017, Down To Earth). Other states, however, are trying to make the most of every opportunity to ensure that they are sand-surplus. In November 2017, after the Tamil Nadu government seized the sand imported by MRM Ramaiya, the company diverted its second shipment of 45,000 tonnes of sand to the Cochin port. “Within three days, we received a go-ahead to sell the stock,” says Vijayraj. The sand is now being sold in Kerala at Rs 2,000 a tonne; market rate in the state is Rs 2,500 a tonne. In Karnataka, Mysore Sales International imported 54,000 tonnes of sand from Malaysia in December 2017 and is selling it at Rs 3,900 a tonne; the market price in the state varies between Rs 5,000 and Rs 6,000. Maharashtra and Andhra Pradesh are also planning to import sand from the Phillippines. They are now surveying the market demand for it as Filipino sand is dark in colour due to the presence of volcanic ash in it. 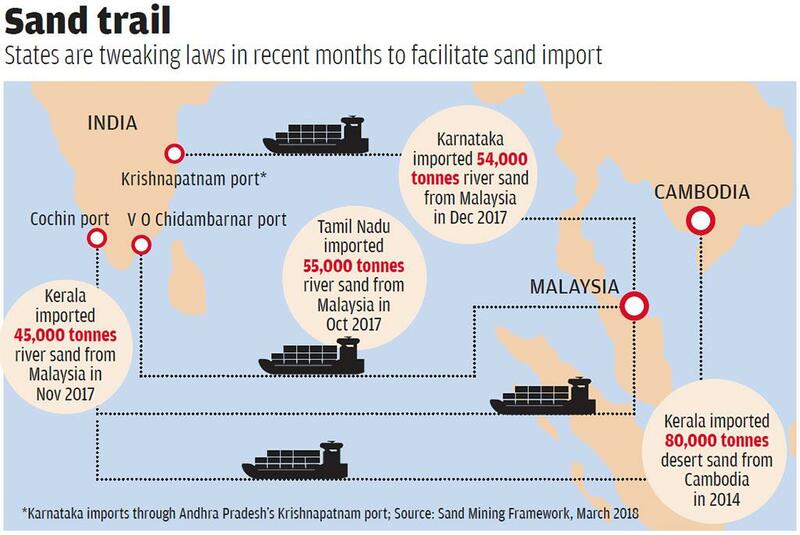 To encourage sand importers, particularly in the aftermath of Tamil Nadu incident, Karnataka and Kerala have amended their mineral concession rules, laying down the procedure for sand imports. The reason for their desperation is clear. All these states are witnessing a construction boom. Going by Census 2011, all states except Andhra Pradesh have more than 35 per cent of their population in urban centres. Across the country, the construction sector has grown at a Compound Annual Growth Rate of 6 per cent between 2016 and 2010, up from 2.95 per cent during 2011-15, according to the Central Statistics Office. But there is not enough sand to meet the growing demand. In 2017-18, the Ministry of Mines (MoM) conducted a survey of 14 major sand producing states. Its estimates show that the demand of sand far outstrips supply in all the states, except Haryana, Uttarakhand and Madhya Pradesh. Tamil Nadu, which experiences the maximum deficit of 65 per cent, has the highest demand for sand. But it produces only 18 million tonnes per annum (MTPA). Its neighbour on the eastern coast, Andhra Pradesh experiences a 50 per cent deficit of its total demand. Karnataka experiences a deficit of 20 per cent (see ‘Precious resource’). Rajendra Kumar Kataria, secretary of Karnataka’s State Department of Commerce and Industries, says the state is now left with just 26 million tonnes of river sand reserves. Prithul Kumar, director at MoM, says the deficit is partly due to the judicial bans on sand mining without ensuring ways to meet the growing demand. “Bans by the courts or the National Green Tribunal (NGT) have led to the shortage of sand supply in many states. NGT banned sand mining in parts of Maharashtra in 2017. That year Uttarakhand High Court too imposed a four-month state-wide ban on sand mining. Such instances disrupt the demand-supply ratio,” he says. 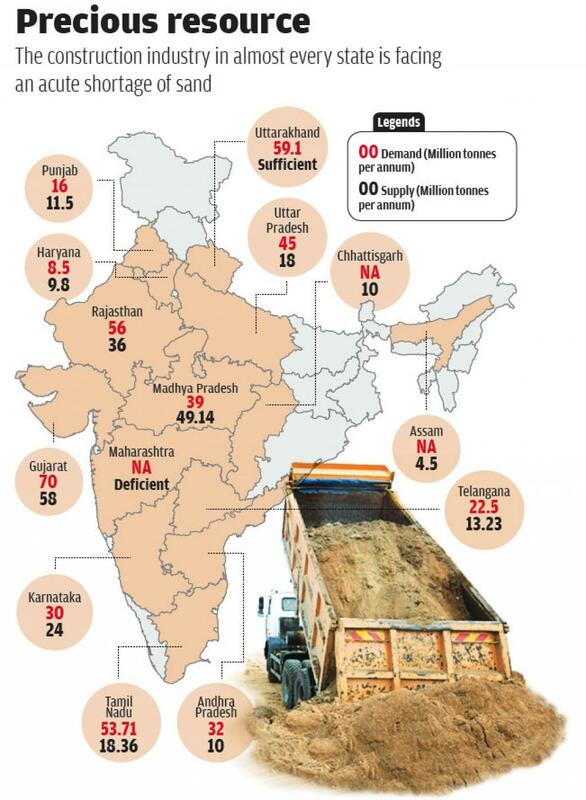 This demand-supply gap has now created a parallel sand market across the country. In the absence of any consolidated government data, the 2017 report of the Comptroller and Auditor General of India (CAG) says illegal sand mining cost the state exchequer of Uttar Pradesh a massive Rs 477 crore in 2015-16. Kerala lost Rs 1.63 crore in 2014, says the 2014 CAG report. Moreover, each state has a different process of identifying sand mines, issuing environmental clearances, and operating and monitoring the mines. In most states, barring Andhra Pradesh, Chhattisgarh, Tamil Nadu and Telangana, mining companies can apply for environmental clearance only after getting the mining lease. This increases the risk of non-compliance. “The advantage of taking up the clearance by the mining department ensures that the regulations laid down by the government as well the Ministry of Environment, Forest and Climate Change (MoEFCC) are properly followed,” reads the mining framework. Pricing mechanisms also differ from state to state. While Andhra Pradesh, Chhattisgarh, Madhya Pradesh, Tamil Nadu and Telangana have notified their sand prices, it remains volatile in the remaining states where the demand-supply gap determine the market price. 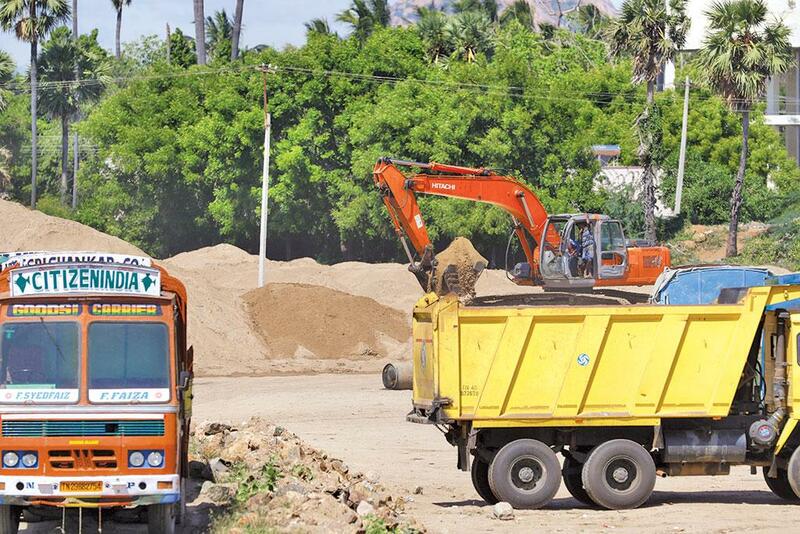 For instance, In Bengaluru, a truck-load of sand costs Rs 100,000, while in Mumbai it could cost about Rs 70,000. State rules also differ on who operates the mine. In states, “where the control of operations is with the lessee, the main motive from the business is to make as much money as possible,” reads the document. So even if the government lays down regulations, in absence of robust monitoring mechanisms, the lease holder can evade the regulations. And this is the primary reason NGT and courts have imposed bans on sand mining at various places. The mining framework says there is an urgent need to implement the sustainable sand mining guidelines issued by MoEFCC in 2016. The guidelines say, among other things, the creation of District Survey Reports (DSR) to estimate sand availability in the mining districts. While most states have formulated DSR, according to MoM data, no state has carried out a replenishment study, a crucial piece of information when it comes to sustainable mining, says Kumar. The guidelines also talk about employing information-technology techniques to monitor sand mining. One way of doing this is to only allow transportation through a system of e-permits to sand transporting vehicles along with installing GPS in them. But implementation has been poor across states. Only five of the 14 states namely, Gujarat, Karnataka, Madhya Pradesh, Tamil Nadu and Telangana have the provision of online transport permits in their states. “The remaining states still follow the manual passes for transportation of sand in their states. However, even in states where sand is transported using online permits, the online transit pass alone cannot serve the purpose as the transporters are getting photocopies of the pass and trans-porting sand multiple times on a single pass,” says the report. The recommendations are no doubt robust. But can the politicians and officials implement it without giving in to the sand mafia? Sand is the new oil, and the world is witnessing a mad scramble for it. Sand, along with gravel, are already the most extracted minerals—accounting for 69-85 per cent of the minerals mined every year, says the United Nations Environment Programme (UNEP). Its international trade has also witnessed a six-fold increase in the past two decades, as per the UN Comtrade database. This overbearing demand for sand has trigger-ed an ecological crisis. Says a 2014 UNEP report “Sand, rarer than on thinks”, “The volume (of sand) being extracted is having a major impact on rivers, deltas and coastal and marine ecosystems, results in loss of land through river or coastal erosion, lowering of the water table and decreases in the amount of sediment supply.” The report adds that the global sand extraction in 2012 (22.2 billlion tonnes) was higher than the yearly amount of sediments carried by all rivers in the world. The ecological cost of this flourishing trade has triggered widespread protests, especially in the exporting countries. Immediately after MRM Ramayia imported sand to the Chidambaranar port in Tuticorin, Malaysian media reported the country’s Minister of Natural Resources and Environment saying the company did not have the required permissions. The minister later changed his stance. Ramayia is the first foreign company to trade with Malaysia after the country lifted its 19-year-old ban on sand exports in 2016, a decision that has led to discontent among environmental activists in Malaysia. Singapore, a major sand importer, has used the mineral to increase its land area by over 20 per cent since 1965. The island country has over the years imported more than 72 million tonnes of sand from Cambodia. This prompted Cambodia to impose a permanent ban on exports to Singapore last year. Similarly, Indonesia banned sand exports in 2007 after the country lost around 24 islands due to excessive exports to Singapore. Vietnam is also facing a crisis due to sand exports. In 2017, Pham Van Bac, director, Vietnam’s Department of Construction Materials, Ministry of Construction, warned that the country will run out of sand by 2020 at the current rate of demand. Despite the ecological cost, the global demand for sand is expected to grow on the back of the construction industry. According to US-based research firm Persistence Market Research, the global construction aggregates (which includes sand) market is estimated to grow at a compound annual growth rate of 6.1 per cent between 2017 and 2025. It adds that within the aggregates market, sand will be most profitable due to the depletion of natural sources. Going by the current trend, most countries will impose a ban on sand exports in the near future. This is the reason India should develop better regulations and find alternatives to sand. The country, in 2016, amended the Environmental Impact Assessment Notification, 2006, and then released the Sustainable Sand Mining Management Guidelines to “restore and maintain ecology of river”. The report says districts should be made responsible for mapping sand mining potential, along with the implementing and monitoring of the guidelines. The district survey reports are yet to be finalised in most states and the country still does not have credible data on sand mining. India is also looking at several alternatives to sand, but their use remains limited despite the potential. One of the alternatives is recycled Construction and Demolition waste (C&D waste). India generates 25-30 million tonnes every year, but currently processes just 5 per cent of it, as per the Guidelines on Environmental Management of Construction & Demolition Wastes released by the Central Pollution Control Board in March 2017. The guidelines add that the C&D waste accounts for 25-30 per cent of the total solid waste generated and can be used for “paving blocks, lower layers of road pavements, colony and rural roads” (see ‘Beyond sand’). The Ministry of Urban Development (MoUD) in a circular issued on June 28, 2012, had asked states to set up C&D waste recycling facilities in all cities with a population of over 1 million, but the country today has only three plants—two in Delhi and one in Ahmedabad—with a combined capacity of 2,700 tonnes per day. “Cities have not been able to put in place collection and recycling systems as mandated by the 2016 C&D waste rules under the Environment Protection Act,” says Avikal Somvanshi, programme manager, Sustainable Cities Programme of Delhi-based non-profit Centre for Science and Environment. He adds that the unavailability of city-wise C&D generation data and land crunch are adding to the problem. While India is still struggling, Singapore has already started recycling 98 per cent of its C&D waste. Even the UK recycles a third of its C&D waste, as per a 2014 report by the country’s Mineral Production Association. Another option, which is already being used extensively in Karnataka, is manufactured sand (m-sand). 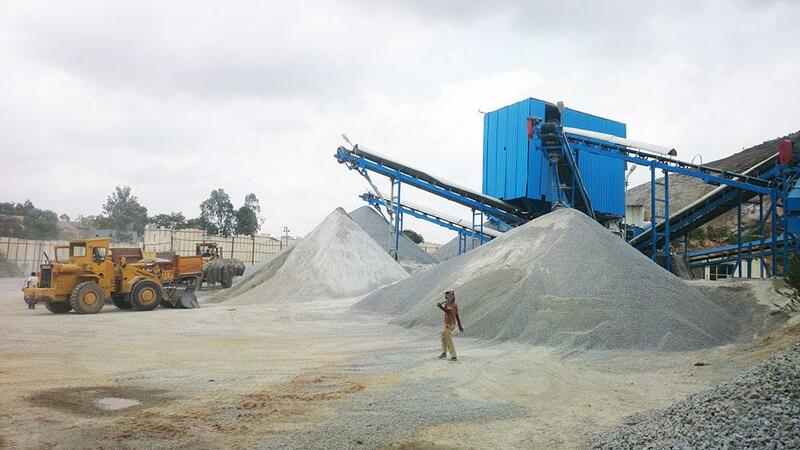 It is produced by the crushing of rocks and quarry stones to a required size of 150 microns. India has 178 m-sand units—of which 164 are in Karnataka alone—that produce 32 million tonnes a year, as per the Sand Mining Framework released by the Ministry of Mines in March 2018. It adds that m-sand is economically feasible, cheaper and is superior as compared to river sand in many of the urban centres in India such as Bengaluru. 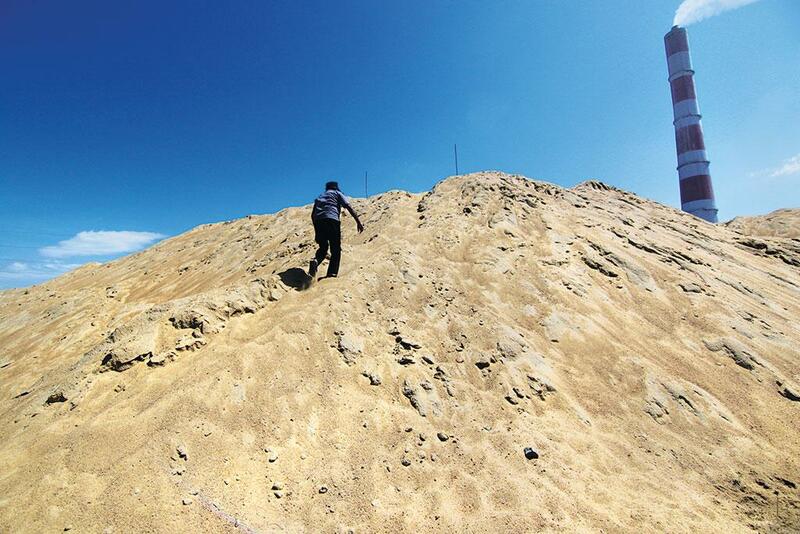 While m-sand has advantages, experts question its long-term practicality. “It is made from crushing stones. So as its demand increases, its environmental impact too will increase,” says Chennai-based builder L Venkatesan. The Centre is also exploring the idea of extracting sand from the overburden of coal mines, which is the area above the coal seam that needs to be removed to carry out mining. Studies conducted by the Central Institute of Mining and Fuel Research, Dhanbad show that processing of overburden yield 60-65 per cent sand. The Western Coalfields Limited, a subsidiary of Coal India, has proposed to set up a sand segregation plant of 200 cubic metres per day capacity near Nagpur and “has committed to supply sand at one-fourth of the market price to NIT Nagpur” for low-cost housing projects. “This option is implementable in all coal bearing states,” says the Guidelines on Environmental Management of Construction & Demolition Wastes. The Centre is also working on capitalising the silting on major dams. India can rely on sand imports till the time it is viable, but it needs to upscale the production of sand alternatives. After all, 70 per cent of the buildings that the country would require by 2030 are yet to be built, estimates a 2010 report by McKinsey, a global management firm. This will surely put tremendous stress on the already scarce resource.